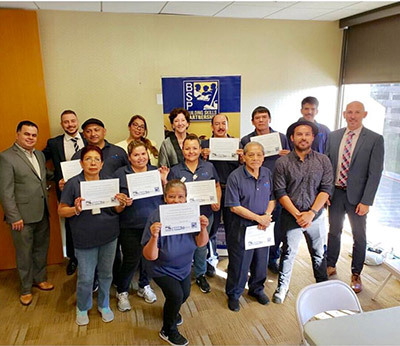 Building Skills Partnership (BSP) represents a unique non-profit collaboration between commercial building owners, the janitors' union, janitorial employers, client companies and community leaders. Founded in 2007, BSP is a statewide organization that works towards its mission to improve the quality of life for low-wage property service workers and their families by increasing their skills, access to education and opportunities for career and community advancement. BSP exemplifies a unique win-win partnership between over 75 janitorial companies, more than 40 building owners, Building Owners Managers Association Greater Los Angeles (BOMA/GLA), the Service Employees International Union - United Service Workers West (SEIU- USWW), and the broader community to train over 2,300 low-wage workers a year, primarily in California's largest cities. Funding for the administrative services of BSP stems from the Local 1877 janitorial union contract. Services are funded primarily through grants from public entities and private foundations. BSP is a high quality vocational education and training program capable of increasing the workforce capacity and economic performance of property service workers. BSP program areas and its curriculum play a key role in driving the productivity and competitiveness of the industry and contributing to the economic and social development of our communities. 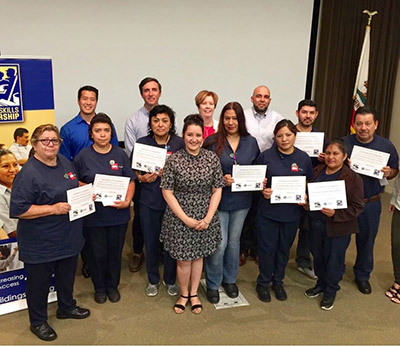 Programs for service workers include ADVANCE Workplace ESL training, Green Janitor Education Program, financial literacy, health and wellness, digital literacy and parent education. For more information on how your building can participate, and successes in each program area, visit the Building Skills Partnership website at www.buildingskills.org.